Kindle Historical Romance Deals for Saturday! 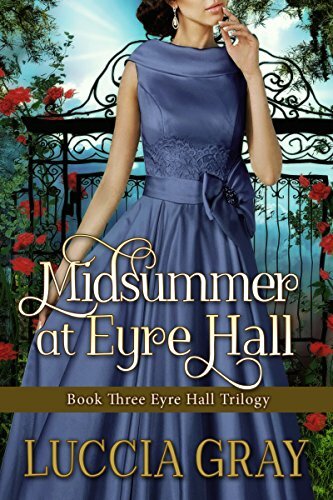 *Midsummer at Eyre Hall: Book Three Eyre Hall Trilogy (Deal, Not Free) by Luccia Gray. Price: $0.99. Genre: Historical Thriller Deal of the Day, Sponsor, Gothic Romance, Victorian Historical Romance. Rated: 5 stars on 1 Reviews. 294 pages. ASIN: B01EEN6RK0. *Echoes in the Mist by Karen Batshaw. Price: Free. Genre: Historical Romance, Romantic Suspense, Suspense. Rated: 4.9 stars on 25 Reviews. 346 pages. ASIN: B01C9GUJ26. He Had a Plan (The Culpepper Saga) by Kathryn Dressler. Price: Free. Genre: Historical Romance, Literature & Fiction, Victorian. Rated: 4.2 stars on 5 Reviews. 270 pages. ASIN: B00DL4RFFU. Posted on June 25, 2016 Author KibetCategories Free Historical Romance Books KindleLeave a comment on Kindle Historical Romance Deals for Saturday! Free Historical Romance Kindle Deals for Friday! *Mail Order Bride Romance: In the Here and Now (A Sweet / Clean Western Historical Romance) (Sweet and Clean Inspirational Christian Romance Short Stories Book 4) by Angelica Rose. Price: Free. Genre: Christian Romance, Western & Frontier, Western, Romance, Inspirational, Westerns. Rated: 4.8 stars on 10 Reviews. 259 pages. ASIN: B01GVD5L3K. *Romance: Once Upon an Arranged Marriage (Historical Duke Rake Romance) (Victorian Duchess Love Romance) by Julia Regan. Price: Free. Genre: Historical Romance, Regency, Holidays, Victorian. Rated: 4.3 stars on 34 Reviews. 130 pages. ASIN: B01GW93HCA. Page: A Sweet Scottish Medieval Romance (Sweet Scottish Brides Book 1) by Tanya Anne Crosby, Alaina Christine Crosby. Price: Free. Genre: Historical Romance, Scottish, NY Times Bestselling Author, Clean & Wholesome, Inspirational. Rated: 4 stars on 13 Reviews. 294 pages. ASIN: B0173QJGLW. NY Times & USA Today Bestselling Author Tanya Anne Crosby. Posted on June 17, 2016 Author KibetCategories Free Historical Romance Books KindleLeave a comment on Free Historical Romance Kindle Deals for Friday!